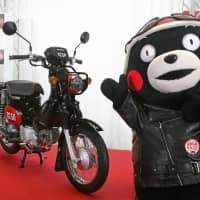 KUMAMOTO - Honda Motor Co. will release this summer a new version of its iconic Super Cub motorcycle featuring Kumamon, the popular black bear mascot of Kumamoto Prefecture. Honda designed the model at the request of the prefectural government, which wanted Kumamon to be incorporated in the automaker’s commemorations to mark production of its 100 millionth Super Cub in 2017. It is also hoped the project will bring encouragement to residents still suffering in the aftermath of the deadly earthquakes that hit Kumamoto in April 2016. Based on the Cross Cub, a more robust-looking, off-road variant of the Super Cub, the motorcycle’s body is painted black and red and has smiling Kumamon decals on each side. Kumamon expressed his pleasure with the new motorcycle. “It’s a very good bike and makes me feel like going to many places all over the world,” the mascot was quoted as saying by an “interpreter” at a ceremony earlier this month at the Kumamoto Prefectural Government building. “It will come in handy for young people to go to school, so I hope it will motivate them to enjoy riding bikes,” said a Honda official. The Kumamon Cub will come in 50 cc and 110 cc models, which are expected to cost around ¥300,000 and ¥350,000, respectively. The bikes will be produced at Honda’s Kumamoto factory in the town of Ozu. The basic functionality of the Super Cub has remained unchanged since its debut in 1958. The rider is able to use a foot to change gears to allow one hand to remain free, handy for people such as food delivery workers. Gaining a strong reputation for fuel efficiency and durability, Super Cubs have been produced and sold in many countries, especially in Southeast Asia and South America, according to Honda. 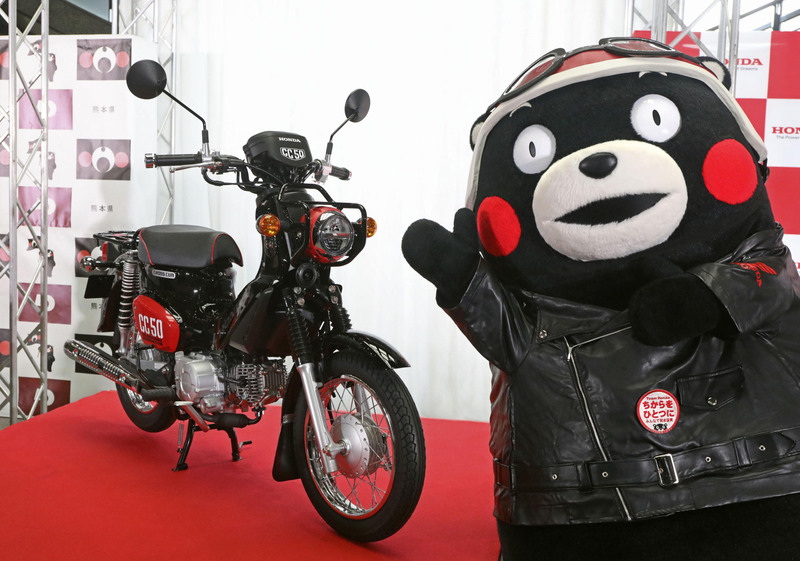 This is the third time that Kumamoto Prefecture and Honda have collaborated to release Kumamon-themed motorbikes, following the Monkey model in 2014 and the Giorno model in 2016. Since his debut in 2011, Kumamon has become one of the most famous yuru-kyara (mascots) in Japan. The characters are created to promote various municipalities and areas.